The Ivy Carat Jewelry box from KJ Global Ltd. has a 2″ color TFT LCD screen in the lid. There’s 128 MB of memory and a USB rechargeable battery with a 1-2 hour life. The jewelry box can play a 3GP file with sound (conversion program included) or display a .JPG file. The KJ Global company is in the UK, but they apparently ship globally. The ring box is £80.71 (about $126). 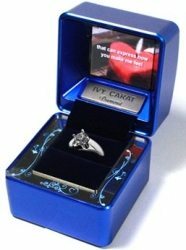 The Ivy Carat Jewelry Box can make your proposal even more memorable. May I ask how can I order this product? Thanks. @Jacky did you try the link in the news post? It’s possible that they no longer offer this item since the news post was from 2 years ago. @Julie Thanks~ I am looking for a LCD ringbox for my gf, but seems most of them are out of stock. @Jacky Hope they come through for you.